Kennedy Kashiwa, 14, has faced many obstacles. Following the death of his parents, he and his older sister moved in with their grandmother who had no steady source of income - an uncomfortably common story in the impoverished communities surrounding the city of Kabwe, Zambia where Kennedy lives. But Kennedy has faced more adversity than most. At the age of 7, the young boy fell from a tree and, because there was no money to seek treatment and no access to aid for health purposes, he lost his ability to walk. Kennedy couldn’t attend school for a long time because he had no means of getting there. Recently, concerned care workers communicated Kennedy’s story to a donor in Canada, Visionledd. 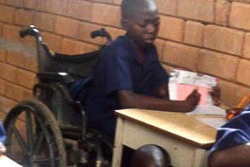 Now, Kennedy has been given a wheel chair and can attend school and, though the setbacks have placed him at a grade 4 school level, Kennedy has strong aspirations to complete his education. Kennedy is regularly visited by local care workers who monitor his health and provide food parcels. The donation of a wheelchair has made an immeasurable difference in Kennedy’s life. Because of the love and encouragement of local care workers, Kennedy has hope once again and dreams of one day visiting specialists to help him walk again.